Bessy and Bud's House, An East Texas Tale of Puppies and Mosquitoes. The old "plank" board house is long gone now, but how well I remember it. It was set back only a short distance from the main road through Huffines, Texas and was an all gray, never-painted wood structure with a corrigated tin roof and front and back porches that were long and tall. If we children weren't careful (and sometimes we weren't), we would get a wood splinter in our foot, leg or heinie from those rough boards. A water well with curbing was near the back porch and there was a rope and bucket for drawing water. The well was so deep it seemed to take five minutes to pull up each bucket of water. Besides this inconvenience, there was also no gas, electricity, phone or indoor plumbing. Bessy Stevenson did a lot of her work out there on that back porch. Like hand-drawing water from the well and heating it in a wood-fired cast iron washpot. She used #2 and #3 galvanized wash tubs and a scrub board to wash and rinse the laundry. Then it was hand wrung (sometimes Bud would help with that) and hung across a yard fence or wire clothesline to dry in the wind and sun. The whole yard was clean, smooth dirt hoed clean of any grass or vegatation. There were a good many chickens running around about the place. Raised in a coop, they were kept for eggs, meat, and garden fertilizer. Almost daily, Bessy and Bud would collect vegatables from their nearby garden and clean and prepare them right there on the back porch before taking them to the kitchen. The scraps were thrown in the yard for the chickens to eat. 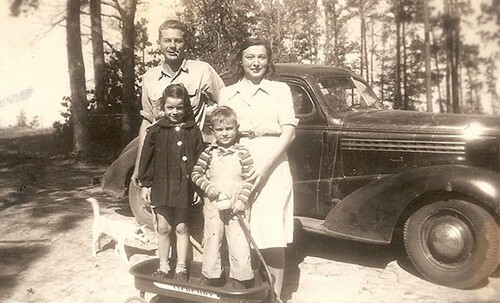 Bessy and Bud Stevenson were our family friends and had no children of their own. We visited them maybe three or four times a year. Huffines was about seven miles from my house near McLeod. and we'd drive over in the 1939 Chevrolet pickup my dad used to work in the oil fields. I was about six or seven on this particular visit and this time Bud had some mighty pretty, warm and cuddly puppies. I wanted one of those puppies awfully bad. So, Bessy and Bud made a deal with me and my parents. If I would stay the night with them, I could have a puppy. At first I thought, it wasn't a bad deal; but a few hours later, I wasn't so sure. "Recently found this picture of me and my family... It was taken in 1942... The little white dog is Poochy, the subject of my story." I remember it as though it was yesterday. As I lay there on that front porch, listening to the old Chevrolet pickup leaving down the gravel road, I was left with those "old" friends, acutely aware of how far I was from home and family. I remember crying a good bit and Bessy comforting me; but it wasn't long until those puppies absorbed my attention. That night at bedtime, it was a whole 'nother experience. Mosquitoes were bad around that place. Bessy had a bed with tall corner posts and yes, a mosquito net. The net looked like a large white cheese cloth and covered the entire bed. It draped from the top of the tall corner posts to the floor. When Bessy took me to bed with her that night and enclosed us with that white net, it was sorta scary inside that big white box. But I was very tired and was asleep in a flash. As we slept, there was no problem with mosquitoes, but for Bud, asleep on the floor, it was another story. He didn't have a mosquito net and it never occurred to me until years later that those Texas mosquitos probably did a " job" on him. That was my only experience with mosquito netting until many, many years later when I found them very useful while camping. Needless to say, after completing my part of the arangement, I got my warm, fuzzy and cuddly puppy, which turned into a super good squirrel dog not many years later when I started hunting.